President Trump’s new car is going to be huge. A camouflaged prototype of the next-generation presidential limousine has been spotted undergoing last-minute testing by General Motors ahead of its imminent delivery to 1600 Pennsylvania Avenue. The large sedan-style vehicle makes the Chevrolet Suburban SUVs parked next to it look like compact cars. That’s because it’s believed to be built on a medium or heavy duty truck chassis, although its details are shrouded in top secrecy. 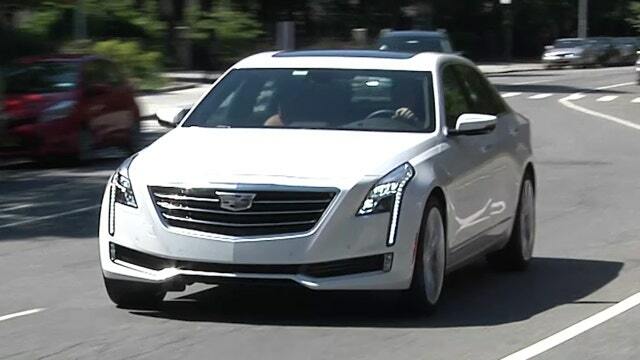 The design of its front and rear ends closely apes that of Cadillac’s current sedan lineup, while the exposed chrome trim on the door handles and around the windows is a tip-off that it is nearly ready for the road. Like the current state car – known as “The Beast” – the vehicle should be heavily armed against ballistic, IED and chemical weapons attacks, and also fitted with an advanced communications suite and emergency medical equipment. While the limousine was widely expected to debut on Inauguration Day, the $15.8 million program to develop and build an unspecified number of the vehicles has a completion date of 3/30/2017, so it should be picking up the president for his first ride soon.